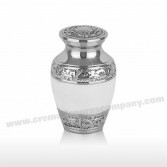 Our mini keepsake urns are made of either solid cast brass or solid cast aluminium, and decorated in just the same way and with the same level of care as our adult urns. 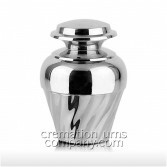 They also echo the designs of the big urns so they can easily be matched up if required. These keepsakes are designed to hold just a small amount of ashes and there small size allows you to keep them on display or store them privately with ease if preferred. 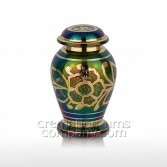 The Delphi Blue Mini Urn keepsake is a cast brass miniature adult urn. 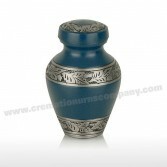 It has a beautiful matt blue body with engraved pewter bands around the bottom middle and top. 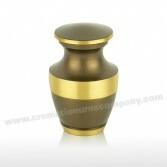 The Dignity Mini Urn keepsake is a cast brass miniature adult urn. 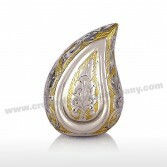 It has a beautifully smooth matt brass finish embellished with fine and intricate engraving. 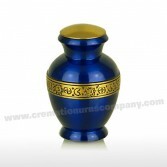 The Blue Heavens Mini Urn keepsake is a cast brass miniature adult urn. It has a beautifully rich cobalt blue body with a gold band around it embellished with moon and stars motifs. 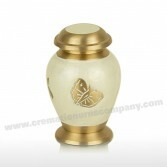 The Pearl Butterfly Mini Urn keepsake is a cast brass miniature adult urn. It has a matt brass finish on the top and bottom and an ivory enamelled band around the middle with beautiful engraved butterflies. 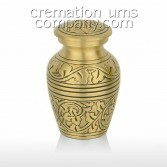 The Silver Leaf Mini Urn keepsake is a cast brass miniature adult urn. 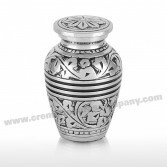 It has a beautifully bright nickel /chrome finish, embellished with fine and intricate engraving.